Today’s episode is a celebration of the annual Mill Road Winter Fair. Matt & Alan visit the food fair on Gwydir street and interview The Original Truffle Company, Inder’s Kitchen, Cambridge Farmers Outlet, Cam Cattle, Pavitt’s Pies, The Moonshine Brewery, the Platelickers Supper Club, Limoncello, Art of Meat, The Gingerbread Lady and Urban Larder. In addition we discuss a recent feature from The Guardian on the Top 10 Independent places to eat in Cambridge, Tom Lewis joins us in the studio to give us his latest wine recommendations, and Alan, and a review of the food items in the Saturday quality press. Flavour is presented by Matt Bentman, Alan Alder & Ruth Reyes. Direct links to previous episodes, or jump to latest episode. – 24th November 2012: Featuring Christmas gift cook book recomendations courtesy of ‘Books for Cooks’ in Notting Hill, Matt revisits Otto Cafe, ‘Clueless in the Kitchen’ attempts to cook a cauliflower cheese, and Tom Lewis advises on wines for a good night in! – 10th November: Under the spotlight this week is The Oak Bistro, Francesca Re-Manning of La Dante the Italian Cultural Centre and English Study Centre. We revisit the Platelickers Supper Club, catch up with Nord on Bridge street and Urban Larder on Mill Road and find out about the forthcoming Cambridge Wine Merchants wine, ale & whisky festival. – 27th October 2012: With the newly re-opened ‘Norfolk Street Bakery’, ‘The Art of Meat’ in Arbury, The Cambridge Gin Distillery (Part 2 of a Two-part feature), Wine Expert Tom Lewis directs us away from big brand wines, and Avasara; a new Indian catering service for Cambridge. – 13th October 2012: Featuring Alimentum chef-patron Mark Poynton, Inder’s Kitchen, The Cambridge Distillery (Part 1 of a Two-part feature) and more from wine expert Tom Lewis. We also learn about the Allotments scene in Cambridge and some newly formed Food Tours! – 29th September 2012: Interviews with Tim Hayward, the co-owner of Fitzbillies (Part 2 of a Two-part feature), Lauren Hodges of The Mill, Cambridge Wine blogger Tom Lewis discusses wine tasting, and Colin Joyce from Cambridge City Council informs on the latest food & drink sellers in Cambridge Market. Also featuring some vox-pop comments about British food! – 15th September 2012: Interviews with Tim Hayward, the co-owner of Fitzbillies (Part 1 of a Two-part feature), Pavitt’s Pies, Simon Fraser of Hot Numbers cafe and introducing two new voices to the programme: wine critic Tom Lewis and team member Ruth Reyes. – 1st September 2012: Featuring Otto cafe, an update from award-winning Inder’s Kitchen, the latest beers from a selection of Cambridge pubs, and Matt gets ‘Clueless in the Kitchen’ with homemade cereal bars. – 18th August 2012: Investigating the Cambridge Chili farm, Massaro’s, Limoncello, The Bun Shop and The Moonshine Brewery. – 4th August 2012: We read up on the latest cookbooks to grace the shop shelves, ‘Clueless in the Kitchen’ serves up something simple. We replay some choice cuts from local producers we’ve interviewed in light of the upcoming Food & farming awards, and visit ‘The Art of Meat’ in Arbury. – 21st July 2012: With reports on the Community Crop-share harvest, Books for Cooks bookshop and ‘Clueless in the Kitchen’ nearly earns its first health warning! Also featuring clips of local producers for this year’s Food & Farming awards nominations. – 7th July 2012: An interview with ‘Taylor Made Foods’, we mark ‘Love your local market’ fortnight, and an update on the Transition Cambridge food group crop-share scheme. – 23rd June 2012: Featuring interviews with Peter Voshol of the ‘Loaf for Life’ bakery and a collection of traders from this year’s Town & Country fair including ‘Scarlett & Mustard’ and ‘Jacc’s Gourmet Coffee’. – 9th June 2012: Interviews with Lauren Hodges of the newly re-opened pub ‘The Mill’, Simon Fraser of Hot Numbers cafe, some ideas about wild food and reviews of Cotto and The Cambridge Chop House. – 26th May 2012: A restaurant review of Fitzbillies, we attend the first Platelickers secret supper club, Rob Birch discusses the state of independence of Mill Road, and we drop in on Cambake; a new group dedicated to the traditionally made loaf. – 12th May 2012: The greatest pies and waffles feature in this edition; both available at the Cambridge Sunday Market courtesy of Claire Barker of Brownsfield Farm, and Bernard Willermans from the Belgian Waffle stall. Also, we’ve an interview with dietician Helen Davies, and Luke Webster discusses the science of wine tasting. – 28th April 2012: We meet local food blogger Ivana Gresham, visit ‘Books for Cooks’ in Notting Hill, and hear about Mill Road’s ‘Milly Card’ scheme. Also featuring Luke Webster on the science of wine tasting, and an interview at newly opened ‘Las Iguanas’ on quayside. – 14th April 2012: All about ‘the local food challenge’ organised by Cambridge Carbon Footprint. Interviews with local food blogger Jo Kruczynska and ‘The Cheese & Pie man’ at Cambridge market, and ‘Clueless in the Kitchen’ concocts a cherry & almond pie. – 31st March 2012: A chat with Chris Myers of ‘Cam Cattle’, Simon Steele of ‘Wild Country Organics’, and ‘Clueless in the Kitchen’ crafts a beef & onion pie with cheese pastry, followed by a honey & gingerbread pudding. – 17th March 2012: We visit Sticky Beaks cafe, attend a pie & mash evening at Urban Larder, chat with Colin Joyce the market co-ordinator from Cambridge City Council, and ‘Clueless in the Kitchen’ celebrates St. David’s day a month late by making a leek pie! – 3rd March 2012: Interviews with Noel Young Wines, Cafe Nord and Italian restaurant La Margherita. We also have a feature on the Wild Country Organics stall at the Sunday Market, and news from ‘Fairtrade Fortnight’. 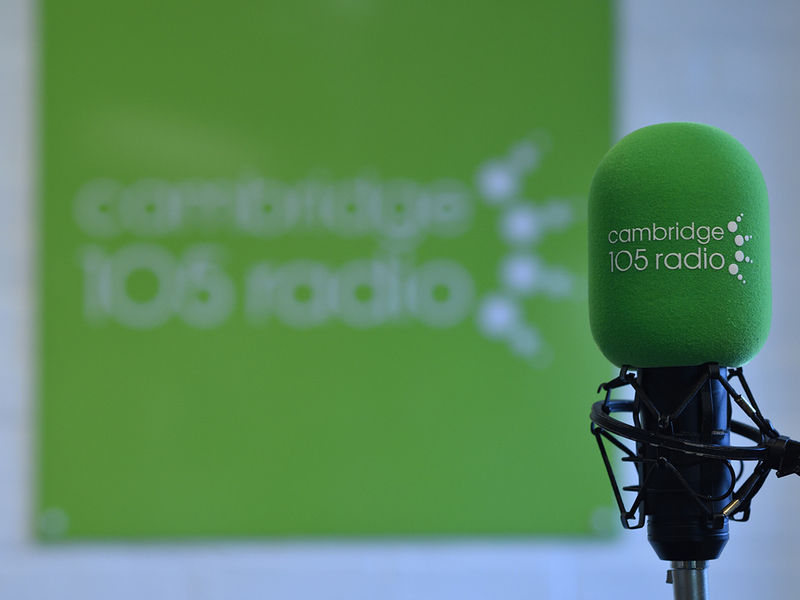 – 18th February 2012: We interview Simon Steele from the Sunday Market Vegetable stall, Balzano’s the Italian delicatessen, Richard Naisby co-founder of The Milton Brewery and Amanda Taylor of the Cambridge City Council and 105′s own Tom Taylor from the ‘Stagger’ & ‘From the Terraces’ programmes. – 4th February 2012: Featuring interviews with Rosie Hogg of ‘Books for Cooks’, Joeseph Kennedy of The Blackbar Brewery, The Gog Magog Hills Farmshop and we attend the annual ‘Seedy Sunday’ event in Trumpington. – 21st January 2012: With Alison Benjamin on her book ‘A World without Bees’, Caroline Child co-owner of Norfolk Street Delicatessen, Polly Plouviez of Urban Larder and Roger Frost from ‘The Science Show’ advises on breadmakers. – 7th January 2012: A retrospective of clips from 2011.